Avoid the habit of clenching your teeth effectively and naturally with hypnotherapy! Target the causes – not just the symptoms: and power your mind to be able to throw away that embarrassing mouth-guard forever! Often a teeth clenching disorder is first noticed and diagnosed by dental professionals, who commonly provide treatment only for the symptoms. As such, many teeth clenchers are sent home with a custom-made mouth-guard that is worn during sleep to prevent unconscious teeth grinding. Ironically, this generally does prevent further damage to teeth, but even the best fitting mouth guard is still going to be awkward, disappointing, or embarrassing. Re-train your subconscious mind to NOT lapse into the old habits of teeth clenching during sleep or during periods of concentration/focus. Steve G. Jones, Ed.D., Clinical Hypnotherapist, charges $1,500 for a custom recording and $25,000 for a one-hour private hypnotherapy session at his office. But you can get all the benefits for this low price. Simply listen to the Avoid Teeth Clenching Hypnosis MP3 download every night as you go to bed for three weeks and feel the changes happening in your life. You will feel more empowered, more in touch with your true self, and you will truly know that your goals are within your reach. Do you often clench your teeth? Sometimes it is easy to catch yourself clenching your teeth in the daytime, you can remind yourself to relax your jaw. However, a lot of people clench their teeth at night when they are completely unaware that they are doing it. If you suspect you are clenching your teeth, I encourage you to visit a dentist so that they can see if you have damaged your teeth. We lead very stressful lives and people tend to carry their stress in their muscles. For some people, they have neck pain or lower back pain because they tense the muscles in their neck and back. People who clench their teeth put amazing amount of pressure on their teeth and jaw. It can take a long time before pain in the jaw or tooth damage is apparent. If you clench your teeth during the day, become more aware of what triggers it. And when you catch yourself clenching down, remind yourself to immediately relax your jaw and let your teeth separate. Clenching your teeth at night is a little bit trickier because you are doing it subconsciously. That’s where hypnosis can help you overcome your habit of teeth clenching. And you find that day by day you are becoming more and more relaxed. Just as you are relaxed right now. You will become more and more relaxed in your daily life. Day by day, relaxing more and more. And you will find that you deal with situations as they arise. If there is a problem, you handle it in that moment. You handle it in a very positive, polite, yet assertive way. You do not carry any stress in the muscles surrounding your mouth. You are kind to yourself. You are kind to yourself and you no longer have time for negative thoughts or feelings. You fill your mind with positive goals and if you should find yourself clenching your teeth or tightening the muscles in and around your jaw, you will keep your mouth slightly open, wide enough to place your tongue between your back teeth. This will help your muscles become loose, loose, loose. This will stop your muscles from tightening. The longer your tongue stays between your teeth, the more your muscles will become loose, limp like wet cotton and you will find them very soon indeed. Now, I want you to picture yourself doing whatever it is that you do when you find yourself clenching your teeth. Perhaps you clench your teeth when you are sleeping or maybe you clench your teeth while stressed out at work or at home, or perhaps you clench your teeth when you are participating in sport. Whenever you most notice yourself clenching your teeth, picture yourself there right now. Imagine the thoughts that are going through your mind. Maybe you are stressed, maybe you are dreaming, or maybe you are trying to get out some aggression. Really feel this emotion right now. How do you feel? What are you feeling? Stress, aggression, tightness? Okay, good. Now, whenever you feel this way, I want you to immediately think about relaxing the muscles in your shoulders, the muscles in your neck, the muscles in and around your jaw, and the muscles in your face and head, that’s right. Go ahead and relax all of those muscles. Feel as if a huge weight has been lifted off your shoulders. Feel your jaw as it slowly lowers. Feel the space increase between your upper and lower jaw, that’s right. Feel all tension just disappear from this area. You fell so loose and stress free. Your neck is not tight; you are completely loose. Your mouth is slightly open and your jaw hangs loosely. From now on you will become aware when your jaw clenches together. As soon as you feel the pressure, you will quickly open your mouth, relax your jaw, and feel all tension disappear. You realize how important it is to stop clenching your teeth. Teeth clenching puts a lot of pressure on your jaw and can cause TMJ and nerve pain. You don’t want that. You want to be relaxed. That’s right, let your jaw hang down. Relax your jaw, your mouth, and your lips. Imagine that you have cotton in your mouth, separating your upper and lower jaw. This cotton is light and fluffy and even when you press your teeth together, there is no tension at all. Your shoulders, neck, jaw and face are completely tension free. You feel so good, so relaxed, that’s right. Now look into your future. Picture yourself six months from now. You have completely gotten rid of your habit of teeth clenching. Feel how good it feels to get rid of that bad habit. You feel as if a weight has been lifted off your shoulders. All the pressure that your jaw used to bare down on your teeth, no longer exists, that’s right. Your lower jaw just hangs loosely below your upper jaw. All the muscles in your mouth and surrounding your mouth are so loose and so relaxed. You no longer clench your teeth because you are becoming more and more relaxed and teeth clenching is a thing of the past. You are so proud of yourself. You have made a major change in your life. You feel so much more at ease now in your day to day activities. So just relax now and drift and enjoy this peaceful state you are in. Teeth clenching is a bad habit that can do a lot of damage to your teeth and your jaw. It is important that you take action to prevent yourself from teeth clenching. Self-hypnosis is a natural and safe way to prevent teeth clenching. Teeth clenching often causes headaches, pain in the jaw area, tooth pain, and over time it can lead to cracked teeth. Your jaw is very strong and it exerts an amazing amount of power on your teeth when you clench them. 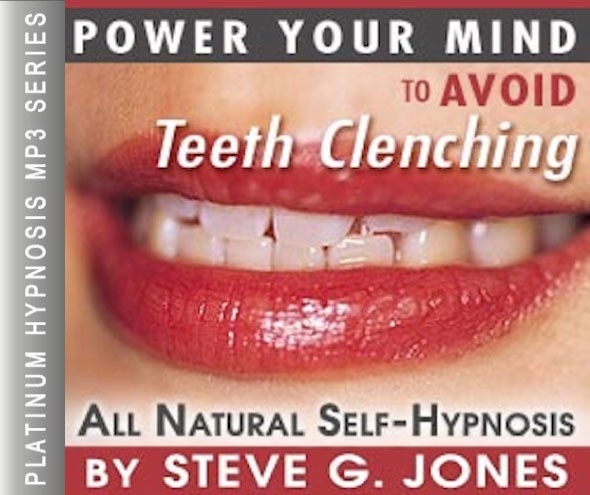 Realize that hypnotherapy can help you stop teeth clenching. If you experience any of the symptoms above, you may be clenching your teeth without even knowing it! Many people clench their teeth without knowing it during the day and night. We suggest you listen to this Avoid Teeth Clenching Hypnosis MP3 audio for 21 nights in a row as you go to bed at night. You will feel relaxed into a deep state of hypnosis as you listen to Steve G. Jones. Then you will be given powerful suggestions to stop clenching your teeth. It takes 21 nights to form a new habit, after 21 nights you should be free of teeth clenching. We suggest that you listen to the recording on a weekly or monthly basis after the initial 21 nights as a maintenance plan.